This is Monurai (Mony) Bhakdina, the owner of Queen Cobra Thai, a business that she credits for making her realize that cooking is her true passion. Like many entrepreneurs in the food industry, Mony started Queen Cobra Thai because she had grown unhappy with her position in the corporate world. But unlike other entrepreneurs, Mony’s food tells a very personal story of carrying on her family’s tradition in a new home. Mony grew up in Bangkok, Thailand and came to the U.S. in 2004. Back then, she says, she couldn’t find any food that was like the food in Bangkok, so she began cooking a lot, recreating the recipes that her grandmother had taught her, as she was the cook in their family that everyone learned from. Her grandmother grew up in Thailand in the 1920s and when she was 10 years old, she was sent to work as a cook in the palace for a royal family. She worked there for fifteen years until she got married and then moved to Chiang Mai, where she opened her own restaurant, specializing in high-end Northern Thai cuisine. In 1983, when Mony’s parents decided to open their own restaurant in Bangkok, her grandmother taught them the recipes that she had created and how to cook each dish. Since her own restaurant had closed at this point and Mony’s father was working as an architect, her mother and grandmother ran the restaurant together for six or seven years until her grandmother was unable to continue working and they had to sell the business. Her grandmother then began teaching Mony how to cook, starting with food prep then spicy beef salad and massaman curry before moving onto more complex presentation skills like carving fresh ginger into flowers (which Mony says she’s still unable to do). It was this personal connection to food, and her family, that spurred Mony’s love for cooking and became a source of comfort for her when she moved to New York. Now Queen Cobra Thai is Mony’s way of passing along the authentic, home cooked, Thai meals that her grandmother taught her to others. Before starting Queen Cobra Thai, Mony was working as a graphic designer at a small advertising company in Manhattan. She had decided to come the the U.S. after earning her degree in graphic design in Bangkok because she wanted to experience the New York lifestyle and since her brother and some relatives were already living in New York, it seemed like the perfect time. But after a while, she realized that the role she was working in was not her dream job. She was constantly feeling disappointed because clients were picking other designs over hers. She had started questioning herself and wondering if graphic design was the right career for her. Her friends and family, who she frequently cooked for and loved her food, saw how frustrated she had become with her job and kept encouraging her to start a food business. The idea stuck in her head and she thought about it more and more until 2013, when she decided to go for it. She knew that Smorgasburg was looking for new vendors and decided to test her food out there since the market would give her access to a large audience. She began selling her food at Smorgasburg on the weekends and working at her graphic design job during the week. She did this for a few months until her food became so popular that she was able to quit her job in graphic design and focus on her food business full-time. For the first few years of the business, Mony sold her food at Smorgasburg, street fairs and other food festivals, cooking everything in her commercial kitchen in Bushwick and then transporting it to events. She was doing really well and getting a lot of compliments on the food as well as a lot of returning customers. Her customers soon started asking her to do catering for events and to host cooking classes so that they could learn to make the dishes themselves. After getting involved in catering and teaching, Mony decided to shift her business to focus solely on these two facets as the food market/street fair circuit had started to cause issues because it was forcing her to depend on a lot of other people to help run her business. Now she only offers catering and small cooking classes (for 2-6 people per class) out of her apartment. She no longer has her kitchen in Bushwick so she rents kitchen space from her friend who owns a restaurant in Chelsea where she preps and cooks all of her catering orders. Mony’s cousin, who works at the restaurant that she rents from, helps her cook the food and she also has four other people that she hires for a certain amount of hours for catering orders that help her with food prep and delivery. But for Mony, her personalized, hands-on cooking classes have become the most exciting part of the business. She’s able to tell her story to small groups of people who really care about her food and are interested in learning where it comes from. Just like her mother’s restaurant, all of the food on Queen Cobra Thai’s catering menu are recipes that Mony’s grandmother created. However, Mony tries to add her own style or twist to each dish, which sometimes ends up happening out of necessity when ingredients that she would typically have access to in Thailand (herbs, spices, palm sugar) aren’t available in the U.S. In some cases, she has to adjust the recipe altogether because she can’t make a substitute with a different ingredient. Although changing her grandmother’s recipes is hard for Mony, she’s used to customizing dishes for her clients that have allergies or dietary restrictions and is able to accommodate those changes. The toughest part for her though is trying to get her customers without dietary restrictions or allergies to stop limiting themselves with food that seems unusual to them. 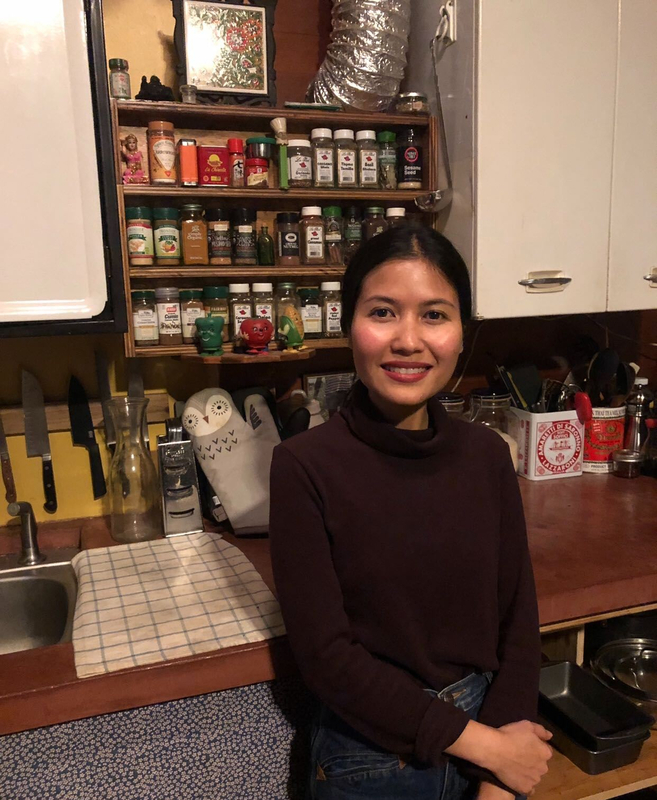 For Mony, Thai food is all about fresh herbs, unique ingredients and balancing flavors, and she wishes that more people were able to experience that and enjoy it rather than questioning it. She cares so deeply about each dish and what she’s putting into it that she wants every customer’s experience to be as authentic as possible so they can really understand the food and the culture behind it. Food and beverage is an extremely hard industry to work in but doing so has allowed Mony to finally figure out what she loves to do and she’s excited every morning when she wakes up to teach a cooking class or prep food for a catering order. The reason she started Queen Cobra Thai was because of her grandmother and her family and her desire to share their story through the food that she creates. And although she hasn’t been able to yet, Mony still has her sights set on opening up a brick and mortar location within a year or two and continuing her family’s tradition. However, since running a restaurant is so expensive and she doesn’t want to risk all of the money that she’s earned in her food business, she’s planning to open a dessert shop where customers can pair Thai desserts with tea. Not only is this Mony’s goal because she likes sweets, she’s also realistic and recognizes that a smaller-scale operation will provide her a better chance of success in the long run. As Mony knows, once you find something that you’re passionate about, you just keep doing it, no matter what. Previous Entry:Food Festivals to Look Forward to in 2019!